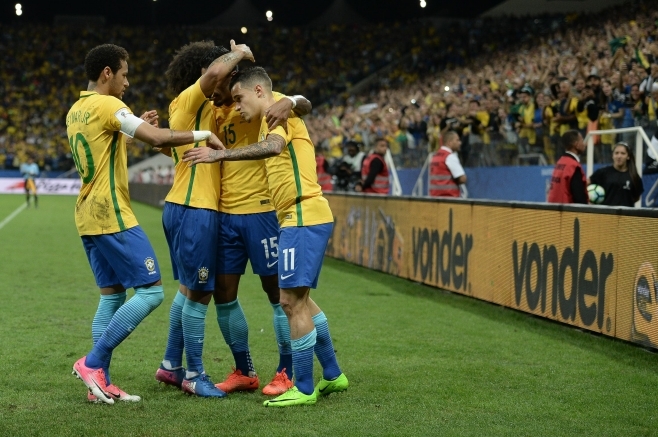 Brazil coach Tite named his Brazil squad for this summer’s World Cup on Monday, with six Premier League starts included. Ederson, Fernandinho, Danilo and Gabriel Jesus of Manchester City are called, along with Liverpool’s Roberto Firmino and Chelsea winger Willian. Danilo is drafted in as cover after a knee injury ruled out first choice right-back Dani Alves. The squad contained few surprises. Taison, Cassio, Pedro Geromel and Fred were the ‘marginal’ players selected, with the likes of Marcelo Grohe, Rodrigo Caio, Alex Sandro and Jemerson missing out. Neymar was named as he recovers from a foot injury. The PSG forward broke his metatarsal in February, but is expected to return for warm up friendlies against Croatia and Austria. Attackers: Willian (Chelsea), Philippe Coutinho (Barcelona), Neymar (PSG), Roberto Firmino (Liverpool), Gabriel Jesus (Manchester City), Douglas Costa (Juventus), Taíson (Shakhtar Donetsk).